Yes, raptor fans, it's almost time for fall migration! To find hawkwatch sites, click here. Find one near you, and try to catch a few hours ogling birds of prey. Do you have a favorite hawkwatching site? Feel free to share details. With that, I'll bid adieu for a week. My vacation location won't include online access, so this place'll be quiet until Sept. 4. Best wishes for a fabulous end to the summer! My suburban neighborhood doesn't pull a huge variety of species. The regulars seen and heard from the apartment's back yard include Black Phoebes, hummingbirds (Rufous? Allen? ), Mourning Doves, Bushtits, House Sparrows, Northern Mockingbirds and House Finches. Of those, I really enjoy Black Phoebes, particularly their flycatching behavior and that decisive snap when they catch a bug. I don't compose lists for personal use, just for reports on this blog during festivals and other birding occasions. There's nothing wrong with listing or listers; some of my favorite birders are avid listers and have tried to convert me. It's just not how I want to spend limited time. Succinctly: my job. I've worked as a magazine editor since 1995 and joined the WildBird staff in 1998. Although aware of birds before that year, the job naturally increased my appreciation of and curiosity for the creatures. Birds have been woven into my life since then. Just this morning, I heard a hummer raising a veritable ruckus in the back yard, and I had to stop getting ready for work to peer out the screen door and find the noisy bugger. Birds are too high on my sensory radar now to ignore. 4. 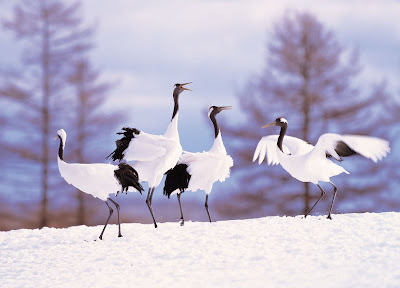 If you could only bird in one place for the rest of your life, where would it be and why? I'd be content to bird only in California. The state contains so many different habitats that I can't imagine tiring of the scenery or the species that visit and live in and on the land and sea. 5. Do you have a jinx bird? What is it, and why is it jinxed? 6. Who is your favorite birder and why? 7. Do you tell non-birders you are a birder? Yep. If I can break a few stereotypes of birders as only gray-haired folks -- great. I'm not evangelical about the topic, but if it comes up in conversation, I'll claim my status as a birder. The U.S. Fish & Wildlife Service just released a draft of the recovery plan for Ivory-billed Woodpecker, and it invites the public -- that would be you -- to review the draft and offer comments. Evidence supporting the Ivory-billed Woodpecker’s rediscovery with the presence of at least one bird in the Bayou de View area of Cache River National Wildlife Refuge was announced in 2004 and 2005. The woodpecker’s rediscovery led to the need to develop a recovery plan. While the woodpecker’s existence has not been confirmed since, tantalizing evidence continues to be gathered in Arkansas, Florida’s panhandle, South Carolina, and other locations across its historic range. Since 1967, the Ivory-billed woodpecker has been federally listed as an endangered species. The species appeared to be widely distributed throughout the southeast prior to European settlement. In this country, the bird ranged from the coastal plain of North and South Carolina, Georgia, Florida, large portions of Alabama, Mississippi and Arkansas, Louisiana, eastern Texas, west Tennessee, and small areas of Illinois, Kentucky, Oklahoma and Missouri. The range became smaller by the late 1800s and the woodpecker was no longer found in Oklahoma, Missouri, Illinois or Kentucky. Ivory-billed numbers continued to decline with the last confirmed sighting in 1944. Until 2004, there had been no confirmed sighting of an Ivory-billed Woodpecker in more than 60 years. The woodpecker’s disappearance is closely linked to logging and the disappearance of contiguous forest habitats that once covered much of the southeastern United States. You can obtain a copy by sending a request to the Service’s Lafayette Field Office at 646 Cajundome Boulevard, Suite 400, Lafayette LA 70506 or by visiting http://endangered.fws.gov/recovery/index.html#plans. The draft plan also can be found at www.fws.gov/ivorybill. You can send comments by mail or hand-delivery at the above address or faxed to 337-291-3139. For more details, contact Deborah Fuller at the above address or by calling 337-291-3100. You can send comments via e-mail to ibwplan@fws.gov. WildBird Advisory Board member June Osborne began writing for the magazine many years ago. Most recently, she wrote a column for each issue, first called "Room With a View," then called "Eavesdropping." When I began working with her in 1998, I fell in love with her enthusiasm, patience and Texas accent. Because she and my boss shared the same name, we began calling her Tex, and that's how she signed off on her e-mails. Reading her articles and columns reinforced my affection for this wise, generous woman who indulged my request for a blog-erview and gave wonderful hugs when we finally met. I'm very sad to type that June's health challenges got the better of her this month. She died peacefully on Aug. 15. In honor of June, WildBird asks her friends, colleagues and readers to send short reminisces to ahooper AT bowtieinc DOT com. Please send contributions by Sept. 4, understanding that we reserve the right to edit for length and clarity. Please be so kind as to share this invitation with other birders. Thank you. LOS ANGELES -- An endangered California condor that was being treated at the Los Angeles Zoo for lead poisoning died this week, a conservation group reported. Tests showed the bird had 10 times the safe amount of lead in its bloodstream after it was caught at Bitter Creek National Wildlife Refuge last month, according to Audubon California, an environmental and conservation group. Only about 300 California condors remain in the world. "Lead poisoning is a tremendous threat to these remarkable birds," said Glenn Olson, executive director of Audubon California. Researchers believe the condor, North America's largest flying bird, may have ingested lead paint or soil contaminated with lead bullet fragments. Scientists at the zoo were not able to determine the source of the bird's lead poisoning, said Dr. Janna Wynne, a veterinarian with the Los Angeles Zoo. The California Fish and Game Commission is set later this month to consider a ban on lead ammunition for hunting in condor habitat. This species' thinking abilities are not news to those familiar with Betty, a New Caledonian crow that created a tool during an Oxford University study in 2002. She did it repeatedly to retrieve a snack from within a tube. Clever bird! Native plants catch on Utah... and in your neighborhood? 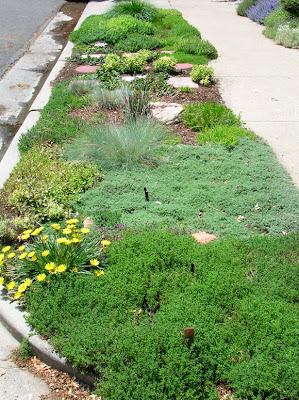 When the Utah Rivers Council began its "Rip Your Strip" program in 2005, the hope was to get 100 people to commit to landscaping the area in front of their homes between the sidewalk and the road in a way suited to Utah's climate. "We had over 1,000 people that year," said Mark Danenhauer, who oversees the program for the council. Participants in the conservation-through-landscaping program numbered more than 2,000 last year and Danenhauer said the program has gotten another 1,000 "rippers" this year. "There's been a culture shift," Danenhauer said. "Previously, if I was talking to a group of people about this and I asked who has heard of Xeriscaping or 'ripping your strip,' only a few hands would go up. Now, when I ask, everyone in the room holds their hand up." Danenhauer credits the shift to people recognizing that planting water-wise yards "is not just cactus and rocks." In the strips and yards of homes throughout the state - including no small number in Sugar House - residents can't go far without seeing well-designed landscapes that use native plants instead of grass to achieve a pleasant and welcoming look. Do you see more neighbors planting native species? Does your city or county offer a program similar to Rip Your Strip? Click that link to see dollar figures about the benefits of xeriscaping! Although this press release doesn't mention birds, I don't doubt that wildlife smugglers include wild-caught birds among their products. U.S. Fish & Wildlife Service employees now work online to catch the criminals. It’s true, said U.S. Fish and Wildlife Service Special Agent Ed Newcomer, that the internet has made wildlife crime easier, and easier to hide. But it’s also made it easier for wildlife law enforcement agents to pose as potential customers – and to catch people. Newcomer thrives on the challenge; he relishes telling the story about how he and his colleagues nabbed a man in Los Angeles not long ago who billed himself as “the world’s most wanted butterfly smuggler.” He sold Newcomer $14,000 worth of protected butterflies and would have sold him $300,000 worth, if Newcomer had had the cash. The smuggler is spending two years in a federal prison. The September/October issue of the magazine showcases the 16 winning images from the annual photo competition. Here's one and another one. And here's one of my favorites. 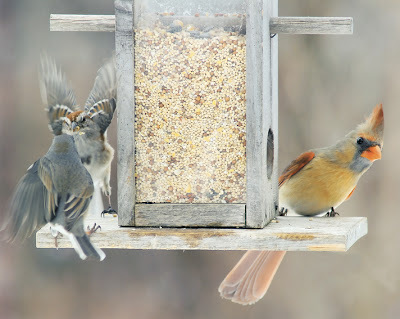 Don Blais of East Greenbush, N.Y., captured this female Northern Cardinal at his backyard feeder as she looked toward the ruckus created by an American Tree Sparrow and a Dark-eyed Junco. I get such a kick out of her body language. As his prize, Don will receive a Droll Yankee Sunflower Domed Cage feeder. Other prizes in the five categories include binoculars and spotting scopes, while the grand prize is a Canon EOS 30D digital camera. Barn owls are better at tracking sounds that move horizontally than those that move vertically, researchers have found. The technique used to make the discovery could one day be used to assess hearing and cognitive skills in humans who cannot communicate. The work, published in PLoS ONE, relies on a phenomenon noted by Ivan Pavlov, of salivating dog fame, in the 1920s. Pavlov saw that animals respond to stimuli such as sudden movements or novel noises with a set of automatic responses, including muscle tensing and pupil dilation. Avinash Bala, a neurologist at the University of Oregon in Eugene, and his colleagues have used this response to monitor when barn owls (Tyto alba) recognize a new sound. The researchers played the owls sounds whose positions differed either horizontally or vertically, and measured the birds' pupil dilation using a beam of infrared light bounced off the cornea. Read on for more, interesting details. The Toledo Blade's outdoor writer raises questions about the validity of a recent report from National Audubon Society. The report discussed 20 common species with population declines by more than 50 percent. Sometimes when an environmental alarm sounds and the ring is hollow, it raises questions about why the button is being pushed. Case in point: The National Audubon Society, a seeming pillar of integrity, may be guilty of spinning the facts about the disappearance of some 20 species of common birds in North America. The society made a big media splash about the disappearances this summer and the mainstream media gobbled it up like a vulture on roadkill. But some veteran students of the birds in these latitudes, and perhaps elsewhere, are saying not so fast. Maybe Audubon is pushing the truth envelope. Which is not to accuse the organization of unbridled political spin-doctoring, the kind of which the benumbed American public has been overdosed to the point of nausea by the major political parties. But picking facts to reach foregone conclusions, when found out, can tarnish an image that takes a long time to fix. Pollick quoted the research director of Black Swamp Bird Observatory, Mark Shieldcastle, as well as Kenn Kaufman. What do you think of their comments? CHARLESTOWN, R.I. - The tiny Atlantic piping plover, a federally protected bird, has given beachgoers headaches for decades. The species breeds on East Coast beaches during warm weather, which means entire stretches of shoreline can be put off limits just as people want to enjoy the coast. But today, two decades after the plover was declared a threatened species, biologists are crediting the beach closures, twine barriers and other buffers between birds and humans for a 141 percent increase in the Atlantic piping plover population. "Those birds have been earned the hard way," said Anne Hecht, who supervises the recovery effort for the U.S. Fish and Wildlife Service. 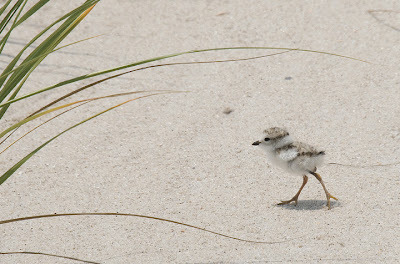 In related news: A photograph of a Piping Plover chick, taken by Catherine Lange of Flushing, N.Y., won first place in the waterbirds category of WildBird's annual photo contest. For her prize, Lange will receive a Golden Ring 12-40x60HD spotting scope from Leupold & Stevens. Alternate pigeon control in Hollywood? Rather than use birth control for the numerous pigeons in Hollywood, Calif., perhaps city officials should hire falconers, like Wimbledon officials did in 1999. Since then, a falconer has brought his birds regularly to the All England Club to keep pigeons from disrupting the annual British tennis championship. Click here for details about the fiction contest about birds, birders and birding... and the potential prizes. Have you heard of the Indianapolis Prize? It came to my attention yesterday. Created by the Indianapolis Zoo and awarded every other year, the first recipient in 2006 was none other than George Archibald, co-founder of the International Crane Foundation in Baraboo, Wis. Dr. Archibald received $100,000 and the Lilly Medal as the inaugural recipient. The Indianapolis Prize was initiated by the Indianapolis Zoo as a significant component of its mission to inspire local and global communities to celebrate, protect, and preserve our natural world through conservation, education and research. This biennial award brings the world’s attention to the cause of animal conservation and the brave, talented and dedicated men and women who spend their lives saving the Earth’s endangered animal species. For the 2008 prize, 30 conservationists received nominations from their peers. The nominating committee, including Dr. Archibald, will select six finalists, who will be announced in early 2008. The prize jury will choose the winner, who will receive the prize at a gala in late September 2008. I hope that one of the finalists works in avian conservation. Who do you consider worthy of a nomination? Every spring and summer for the past 50 years, teams of U.S. 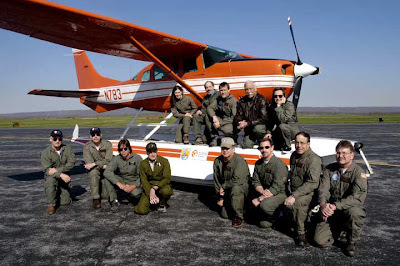 Fish and Wildlife Service pilot-biologists have taken to the skies to survey North America’s waterfowl breeding grounds. Flying more than 80,000 miles, crisscrossing the country just above the treetops, they and observers on the ground record the number of ducks, geese and swans, and assess the quality and quantity of waterfowl breeding habitats. From the wide-open bays and wetlands of the eastern shores of North America to some of the most remote regions of Canada and Alaska, they are documenting an important part of our wild heritage. Click here for a 22-minute video about the 2007 survey, with reports from the pilot-biologists. The video provides a nice follow-up to a previous blog post, and I liked hearing from the biologists who collected the data for the annual survey and watching footage of the habitat and the birds.